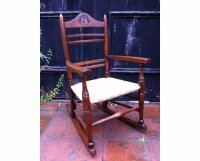 Liberty and Co. A rare Moorish armchair by Liberty and Co.
Liberty and Co. A good quality Arts and Crafts oak armchair, with original Liberty label to the underneath. Circa 1895. 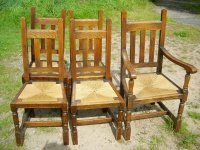 A set of seven Arts and Crafts oak dining chairs attributed to Liberty and Co.
An Arts and Crafts oak settle in the style of CFA Voysey, retaining it's original fabric attributed to The Silver Studio's for Liberty and Co. Lift up seat to access good storage below. Height to top of disc's 66", Width from disc to disc 50", Width at the back 37", Depth 24". 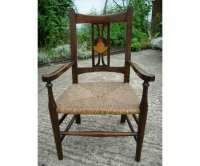 A good quality Arts and Crafts childs rocking chair by William Birch with an inlaid scene to the top from Punch and Judy. Liberty and Co. A good quality Arts and Crafts nursery trunk or toy box with hinged top, the front inlaid with Dutch couples dancing and stylised cut-outs to the splayed sides. Length 34", Depth 15" Height 19". Circa 1910. 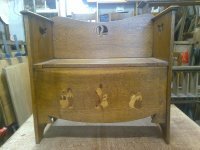 An Arts and Crafts oak settle inlaid with Dutch children and a Flute player playing to a child with stylised Ying Yang cut-out to the back and typical Liberty squashed Heart cut-outs to the sides. Lift up seat for storage. Height 30", Width 31 1/4", Depth 16 1/2". Circa 1905. 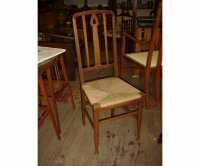 A set of six Liberty and Co Arts and Crafts oak dining chairs with stylised floral carving to the backs. 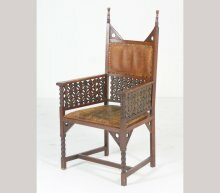 Liberty made an almost identical version of this chair with ebony floral inlays instead of the carved floral details to the backs this set has. 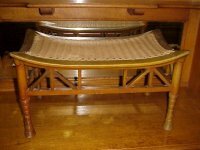 They also supplied a matching draw leaf table with cross stretchers and conforming inlay or carved detail to the centre of the cross stretchers and chequer board inlays around the top. If you are interested in this set I can send you images of the latter. Height 14 1/2", Width 16", Depth 16". Circa 1900. 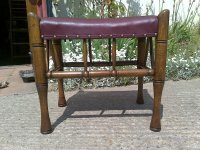 A good quality Liberty and Co Thebes stool, professionally re upholstered in a quality leather. Height 17 1/4", Length 17 1/2", Depth 13 1/2". Circa 1900. 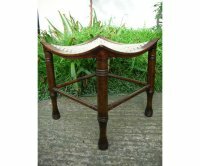 A Liberty and Co Walnut Thebes stool, with turned stretchers uniting the turned legs. A set of five Arts and Crafts oak dining chairs by Liberty and Co. Last two images, variation from The Pictorial Dictionary of British 19th Century Furniture Design, page 252. 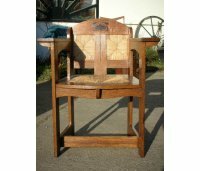 An Arts and Crafts side chair by Liberty and Co, with stylised floral Mother of Pearl and fruitwood inlay to the top. Liberty and Co. (attributed), a mahogany open arm chair, in the manner of Edward William Godwin, with later studded upholstery. 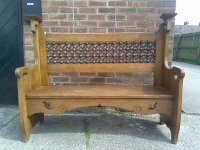 A Liberty and Co oak settle with pierced hearts, scribed and cout-out details and unusually large Musharabieh turnings to the back. 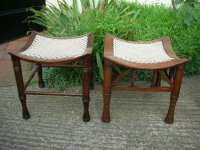 A stylish pair of Arts and Crafts oak armchairs with a Scottish influence, flared arms and unusual floor stretchers. 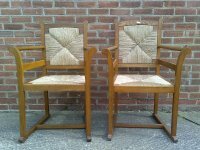 Both armchairs have been professionally re-rushed. 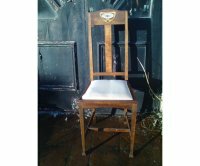 An Arts and Crafts oak chair with shaped padded head rest and a single pewter heart, professionaly upholstered in a quality leather. 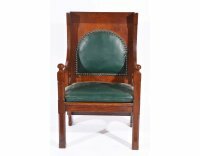 A mahogany armchair with a an intricate stylised carved back spat, inlaid arms and diamond details below the seat. 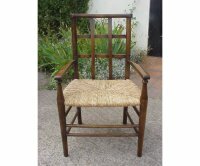 A little liberty and Co rush seated lattice back childs armchair, completely restored and re-rushed. Circa 1900. 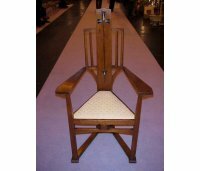 Another little liberty and Co rush seated lattice back childs chair without arms, original rush seat. We could have this re-rushed and re-finished for £125. 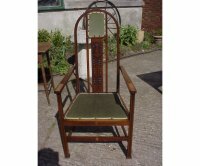 Two Liberty and Co Egyption style Thebes rush seated armchairs, one green stained. 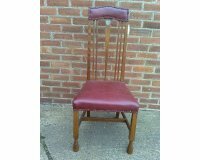 A Liberty style Arts and Crafts oak chair with a heart cut-out to the back. Attributed to E.Punnet and made by William Birch with wonderful Mother of Pearl and Ebony stylised floral inlay. A tremendous design that is well balanced and encompasses the true Glasgow Style. An identical version is illustrated in 'The Birch Design Ledger, illustration number and there is another example in the collection at The Glasgow School of Art (GSA). 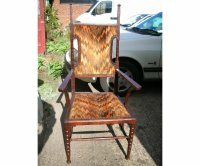 An Arts and Crafts armchair with Ebony on Walnut inlay of a stylised Tulip designed by E.G.Punnet and made by William Birch for Liberty and Co.
A Liberty and Co Walnut Thebes stools, with square shaped Angular supports and line turned details to the lower legs. 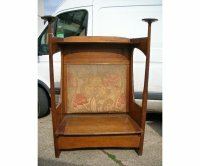 A rare Liberty and Co Walnut duet Thebes stool. Height 14", Length 26", Depth 15". Circa 1895. A little nursery armchair made by William Birch of High Wycombe and retailed by Liberty and Co with inlaid roundel to the back depicting the cow jumps over the moon.